A crêpe is a type of very thin, cooked pancake usually made from wheat flour. Crepes are supposed to be thin and elastic and pancakes should be thick and fluffy. Crêpes belong to the general category of ancient Greek Tiganitai, from Greek tiganos (τίγανος), meaning “frying pan”, which in English is literally translated to Pancakes [Athenaeus, Deipnosophistae, XIV, 645c; Galen, On the Properties of Foods, I, 3]. 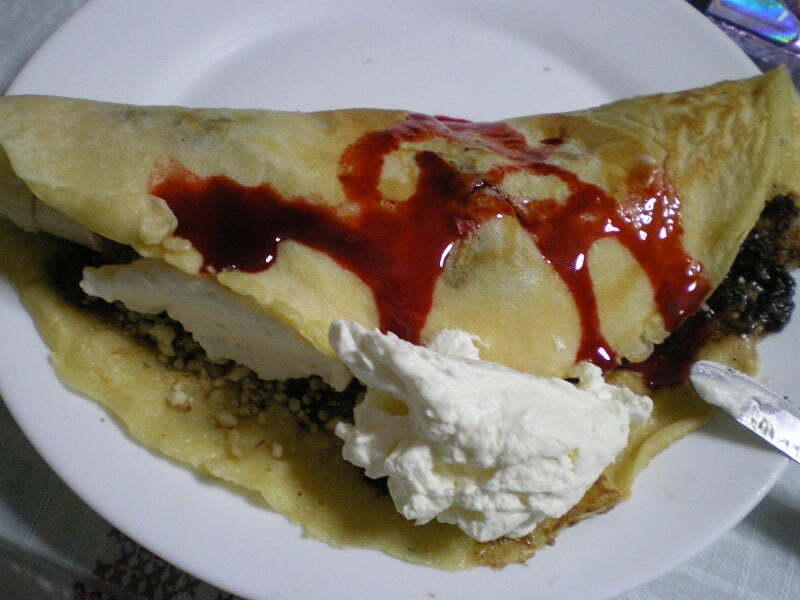 The French term, crêpe, derives from the Latin crispa, meaning tiganitai with “creases”. (Source: Wikipedia). Making crepes or pancakes is not hard. If you can make pancakes, you can make crepes. I don’t use a special crepe pan. I just use an ordinary non-stick frying pan. Actually I use two sizes. The small one is to make crepes which I roll in various ingredients such as ground meat or spinach etc. and have these as a meal. For supper I usually make the big ones and add fruit, ice cream, chocolate, or savory ones with ham, bacon, mushrooms, etc. Don’t worry if your first one doesn’t come out very thin or if it’s ruined. This can easily be fixed. I can’t give you the exact proportion as I don’t know how big your frying pan is but just add batter to cover the pan. So after the first one you can adjust the quantity of batter you will pour in the pan. Make sure that the pan is hot. Now the problem is that by the time you finish the last one, the first one will be cold, so when serving family, on a busy night, it’s sometimes okay if they eat them as they are served. On the other hand if you are making crepes to serve friends that might be a problem. Place them in an oven proof plate and keep your oven barely warm and they’ll stay warm until you are ready to assemble them, or serve them as you make them. Making crepes many times now I don’t really need to weigh the ingredients. I know how much eggs, milk and salt I use as I know that for about 1 cup of milk I need two eggs. Then I add the flour gradually until the batter comes to the right consistency, which should not be too thick. Leftover cooked Crêpes can be stored in the fridge covered with cling film for a couple of days or in the freezer between cling film. With an egg beater whisk eggs with milk, add flour, baking powder and salt. Refridgerate for half an hour. Pour a tablespoon of oil in the pan and wait until it’s hot (this applies only to the first crepe because after that the frying pan is hot and you don’t have to wait). Add a thin liquid batter with a cup onto the hot frying pan and tilt the pan with a circular motion so that the batter coats the surface evenly. Once it is no longer in a liquid form but has set, you must invert the crepe at least once, when you see that the bottom is light brown. Loosen with a spatula, turn and cook the other side. How do you invert the crepe? First by taking a spatula and turning it on the other side, or letting it slide into another plate and then taking the plate you put the uncooked side in the pan and third (only for experts) toss it in the air once so that it lands in the frying pan on the other side. Don’t try the third way because you must really be an expert to do that. If your frying pan is small, turn it with the spatula. If your pan is big use a plate because however expert you are the Crêpe is bound to break. Don’t worry if the first Crêpe sticks to the pan or doesn’t come out perfect. This happens all the time. You will see that the remaining will turn out perfect. Serve hot with your favourite ingredients. We recently bought an electric crêpe maker so after trying it with crêpes we also made some pancakes and omelettes. The crêpe maker is non stick, so no butter is needed either in the batter or on the crêpe maker but if you are using a frying pan, you should grease it. In the video above, I was making Canelloni with Ground Meat and Tomato Sauce or Greek style Canellonnia. Whisk the eggs with the milk. Add salt and gradually add the flour and mix until you have a batter which should not be too thick. Refridgerate for half an hour. Heat the Crêpe maker, according to the instructions. Add a ladleful (about 1/2 cup) of batter in the centre and spread it with the T-shaped crepe spatula. Cook it for about 3 minutes and using the long turning stick, try lifting and see if it lifts easily. If it still sticks on the plate of the crepe maker, leave it to cook for a few more seconds. Put the lifting stick again near the centre, lift it up and turn it over. This time cook it only for 1 minute. (It’s okay if the other side is not as brown as the other side). Serve with your favourite, sweet or savoury filling. Ham, bacon, smoked turkey, cheese, mushrooms, peppers, fresh cream or make canelloni with red or white sauce. Ice cream, nutella, chocolate, dulce de leche, whipping cream, biscuits, spoon sweets (fruit preserves), jams, coconut, peanut butter, cookies, toasted almonds, other nuts, bananas, strawberries, apples, etc. Chocolate, strawberry, sour cherry, coulis, caramel, maple syrup, honey etc. A few days later we decided to see how the pancakes would turn out. As you can see, the pancakes are much thicker than crepes and look more like a thin sponge cake. In a large bowl, sift together the flour, baking powder, cinnamon, salt and mix in sugar. Make a well in the center and pour in the milk and eggs and whisk until you have a smooth batter. Heat the crepe maker (no butter necessary) or grease a griddle or frying pan over medium high heat. Pour or scoop the batter onto the crepe maker, using approximately 1/8 cup for each pancake. As soon as bubbles appear on top, turn on the other side and cook until browned. Serve hot, adding your favourite ingredients on top. This time cook it only for 1 minute. (It's okay if the other side is not as brown as the other side). I’m pleased that in Greece, creperies are flourishing. I often opt for the savoury crepes like “manouri & jambon”.